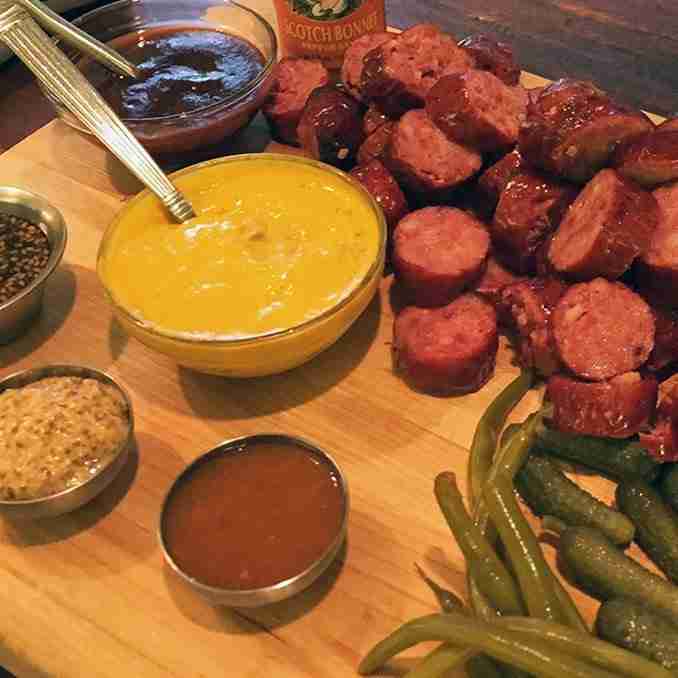 Grilled sausages with a host of dipping sauces: Mango BBQ, Spicy Honey Mustard, Ghost pepper terriayki, 4X horseradish mustard and Scotch Bonnet straight up. Use any sausage or mix of sausages you prefer. I like to use a smoked sausage, chorizo, green onion sausage, Italian, bratwurst and Andouille. Use what you like and what you have that is locally made and delicious. Every region has different types. Grill the sausages or sear them in a skillet. Slice into bite size chunks. Honey Mustard – Mix Melinda’s Amarillo Hot Mustard Habanero Sauce with honey to taste. I love honey! Mix well. Ghost Pepper Teriyaki – Take your favorite teriyaki sauce (mine is Soy Vay!) and add a few shakes of Melinda’s Ghost Pepper Sauce. Sprinkle in some toasted sesame seeds, If using Soy Vay! Teriyaki, sesame seeds are already in the mix. XXXX Horseradish Mustard – Add horseradish and Melinda’s XXXX Reserve to coarse mustard. Scotch Bonnet – my favorite sausage dipping sauce – simply open a bottle of Melinda’s Scotch Bonnet and pour into a small bowl. If you had to just have one dipping sauce, then this is it!